The second largest country in the world, Canada has no shortage of opportunities for exploration by road. From one ocean to another, Canada’s roads are well maintained, easily navigable, and relatively traffic free – the perfect situation for easygoing and memorable road tripping. The backbone of the roadway system, the Trans-Canada Highway stretches 7,800 kilometres across mountains, prairies, and forests, past sparkling rivers and lakes, historic and metropolitan cities and incomparable scenic countryside. 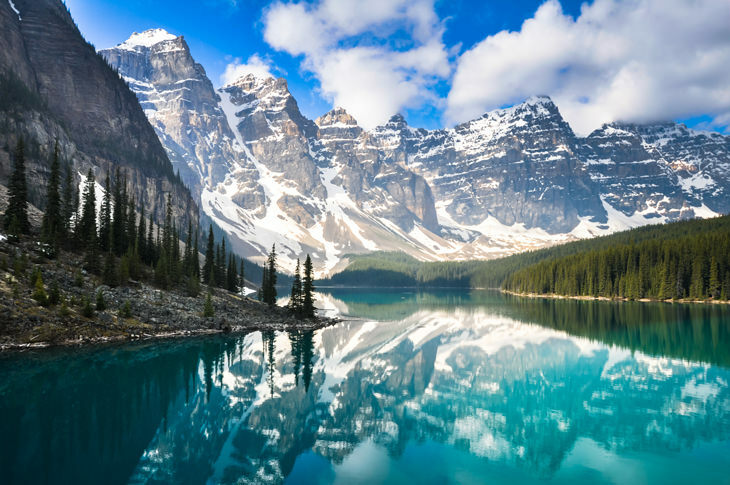 Whether you aim to ‘see it all’ traversing Canada in a motorhome or delve deep into one region of the country, Canada’s many wonders await you. An iconic image, featured on the back of the Canadian twenty dollar bill between 1969 and 1979, the turquoise waters of Banff National Park’s Moraine Lake are some of the most photographed in Canada. Surrounded by the dramatic Valley of the Ten Peaks, this glacially fed lake owes its colour to powdery ‘rock flour’, yet it’s frozen and inaccessible between late October and June. As the summer progresses, the lake’s colour intensifies with the increased levels of meltwater and its bright blue hue peaks in July and August. Just fourteen kilometres from Lake Louise and an hour from the town of Banff, Moraine Lake is a popular day trip for hiking, canoeing, or kayaking. The easy 0.8 km Rockpile Trail affords a stunning view from the top of a natural dam. The Lake With the Twenty Dollar View by Rhonda from Travel? Yes Please! 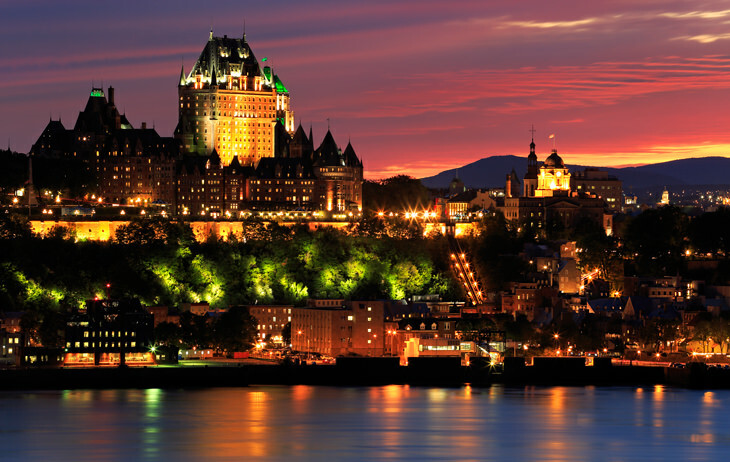 The first hotel built by the Canadian Pacific Railway in the Eastern portion of Canada, Château Frontenac may be the most photographed hotel in the world, due to its prominence in the Quebec City skyline. Operated as a Fairmont Hotel as of 2001, the Château opened its doors in 1893 on a site that had once been the official residence of French and British governors and today the property boasts 600 rooms on eighteen floors. 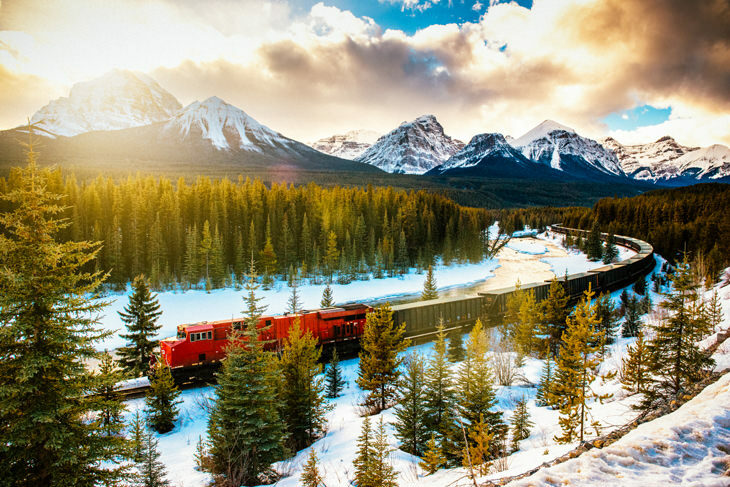 Ten Canadian Pacific Railway properties survive as Fairmonts, most in British Columbia and Alberta, where they were built and operated by the Canadian Pacific, as a way for passengers to experience the scenic beauty of the Rockies and the West – arriving by train, of course. One of the urban-styled hotels in the group, the Frontenac was intended for the use of business travelers and other elites visiting the city. Straddling the Canada-United States border, Niagara Falls is composed of three separate falls: Horseshoe (also known as Canadian Falls), American, and Bridal Veil. Four of the five Great Lakes lie upriver of the falls, making for an immense volume of water cascading downstream- at peak, this flow can be more than 168,000 cubic metres of water per minute. Easily accessed from Buffalo, New York, or Toronto, Ontario, Niagara has been a honeymoon destination since the 1830’s and reached its heyday about a century later. The falls was formed at the end of the last ice age 10,000 years ago and eroded upriver at the rate of three feet per year until control measures were implemented in the 1950’s. 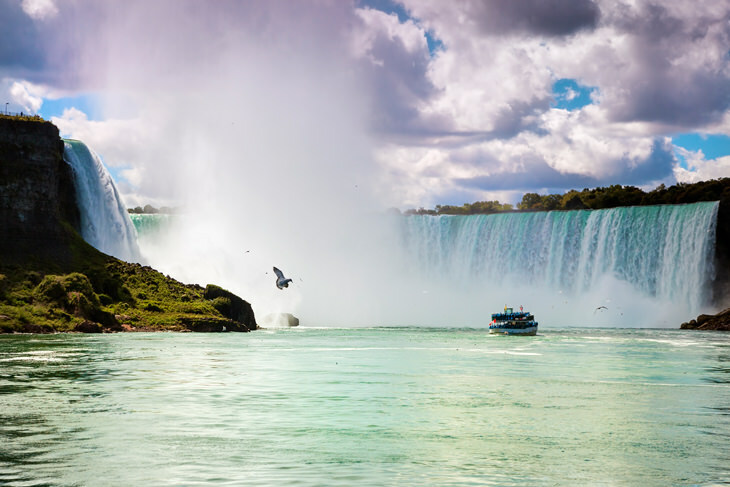 Niagara Falls is also an important hydropower facility for the countries on both shores, while tourists often enjoy activities, such as up close and personal boat tours. A 270-km stretch of water, bordered by New Brunswick and Nova Scotia, the Bay of Fundy claims the world’s highest tidal variation, due to its wedge shape and natural period of resonance. Tides can vary as much as sixteen metres (the equivalent of a five-story building) in just a little over six hours. A key factor in this tidal phenomenon is the sheer size of the bay – billions of tonnes of water fill and empty the Bay of Fundy every cycle, more than the flow of all the world’s freshwater rivers combined. 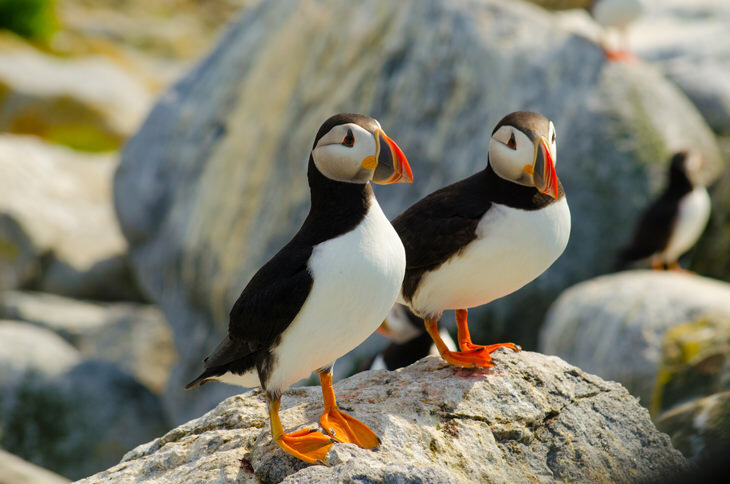 Within the lower portion of the bay, lies Machias Seal Island, the only nesting spot in New Brunswick for Atlantic puffins, nicknamed ‘sea parrots’, because of their colourful beaks. Reached by an hour-long boat ride, over 5,000 pairs of puffins make their home on the island and tours are strictly limited in the number of passengers. In 1904, Robert Butchart came to Vancouver Island’s Tod Inlet seeking limestone deposits for cement production, setting up both a quarry and a plant adjacent to the family home. First inspired to start a Japanese garden by a visiting designer to the city, his wife Jennie in 1909 began a transformation of the then exhausted quarry pit into a tastefully elaborate sunken garden. Under Jennie’s care, until 1939, other gardens were added for a total of 22 ha: Rose, Italian, and Mediterranean. Under the care of fifty full time and twelve part time gardeners, visitors today are treated to literally a million bedding plants of 900 varieties. 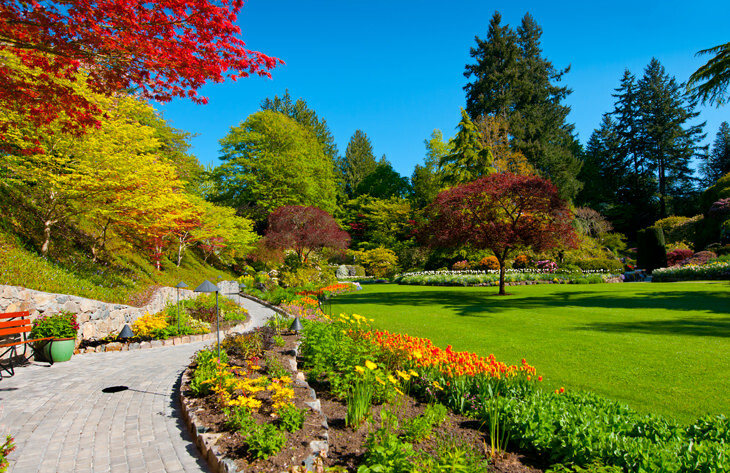 The gardens lie a mere fourteen miles from the city of Victoria and are delightful in the spring, when nearly 300,000 tulip, daffodil, and hyacinth bulbs take bloom. 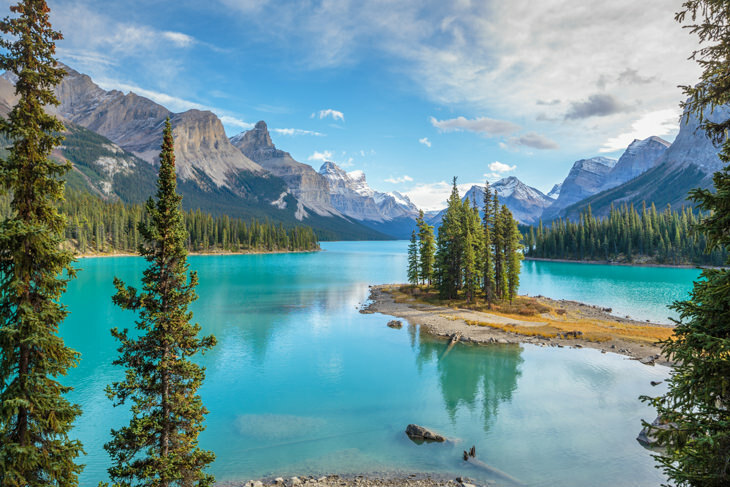 At 22.5 kilometres, Jasper National Park’s Maligne Lake is the longest lake in the Canadian Rockies and the second largest glacier fed lake in the world. One of the park’s most photographed attractions, Spirit Island is only accessible by boat – a journey of fourteen km over ninety minutes. Surrounded by the Queen Elizabeth and Maligne mountain ranges, Spirit Island is only an island once the spring thaw begins. Connected to the shore for the remainder of the year, the winter snowfall here can reach six metres annually. A forty-kilometre journey from the town of Jasper, the colour of the lake changes as you travel south upon the lake towards the island, becoming more emerald in hue, once you reach the waters closest to the glaciers. 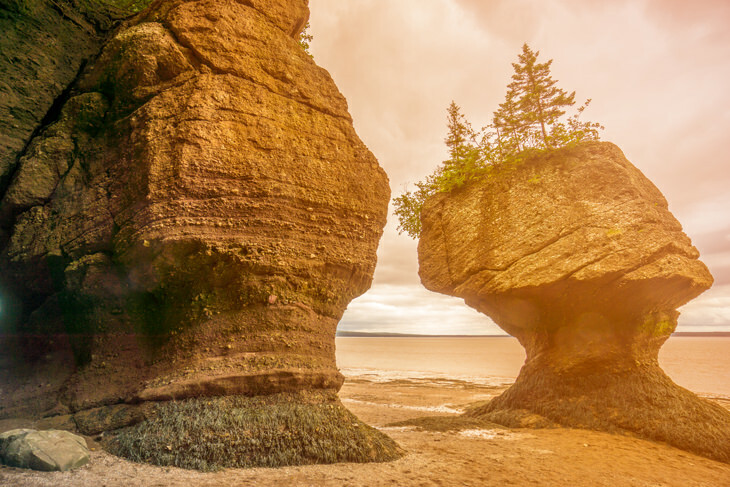 Located in Hopewell Provincial Park on the Bay of Fundy, the Hopewell Rocks – also called the Flowerpot Rocks – are intricately eroded sandstone formations, created by dramatic tidal fluctuations that are the trademark of this area. The natural cycle to fill and empty the bay is thirteen hours and the tides arrive every twelve and a half hours, thus reinforcing the bay’s resonance and providing the power to create these rocky sculptures. Twelve to twenty metres tall, the rocks bear names such as E.T., Mother in Law, Diamond, Turtle, Apple, and Castle. Visit at low tide and you’ll be able to walk out onto the ocean floor; return at high tide to kayak in the same area you walked a few hours before. Other attractions in the Bay of Fundy region include whale and bird watching and tidal bore rafting on the rivers that ‘reverse’ when the bay’s tide comes in. Winter brings a sublime serenity to the landscape of Banff National Park and this easily accessible park opens its doors to visitors seeking winter explorations. All manner of winter sports can be enjoyed in Banff – both downhill and cross-country skiing, snowboarding, sledding, snowshoeing, ice skating on Lake Louise – even dogsled and horse-drawn carriage rides. Winter hiking at Johnston Canyon allows a chance to see frozen waterfalls and the Banff Ice Festival brings the art of ice sculpture to Lake Louise in January. Banff owes its existence as a town to the Canadian Pacific Railway, builders of the Banff Springs and Château Lake Louise hotels for tourist purposes. Today, travelers may travel to Banff on the luxurious privately operated Rocky Mountaineer and Royal Canadian Pacific trains. A fixture of Prince Edward Island National Park, the first lighthouse at Covehead Harbour opened in 1967 and the present 8.2-metre-tall structure dates back to 1975. Always a fully automated lighthouse, Covehead Harbour has never needed an on site lighthouse keeper. A plaque onsite memorializes the Yankee Gale storm of 1851 that took eighty ships and 161 men. 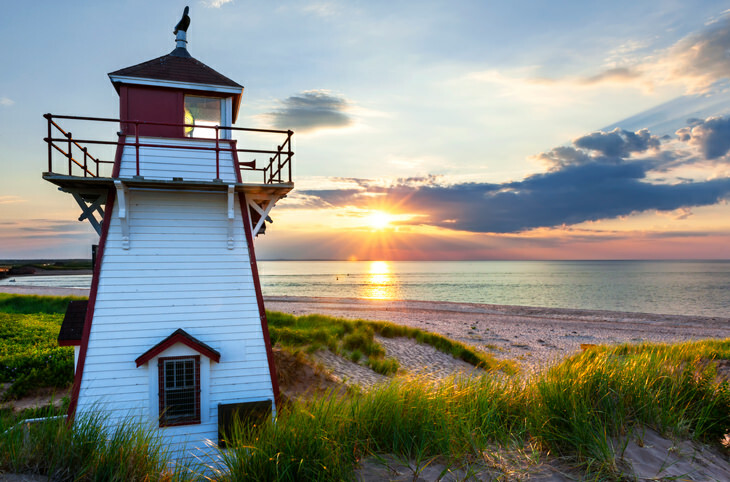 In addition to the lighthouse, Prince Edward Island National Park is home to some of Canada’s best sand dunes, sandstone cliffs, red sand beaches, Acadian forests, and wetlands in the Gulf of St Lawrence, the world’s oldest estuary. Also within the National Park, is the Anne of Green Gables House and several other sites around the island, likewise pay homage to Lucy Maud Montgomery’s Anne. 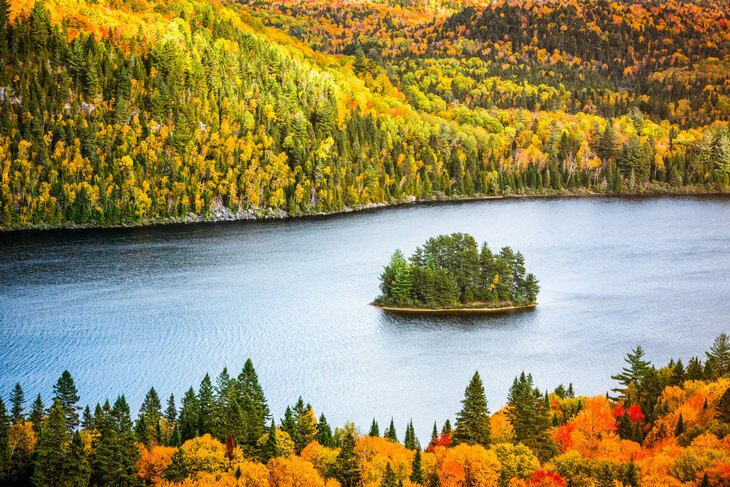 Situated two hours from both Montreal and Quebec City, La Mauricie National Park affords the ability to enjoy many popular outdoor pursuits, such as hiking, cycling, and canoeing. Encompassing a portion of the Canadian Shield, the park is home to 150 lakes, dense forests of conifers and hardwoods, and animals, such as moose, black bears, beavers, and loons. Autumn turns La Mauricie into a riot of bright colour; particularly abundant are bright red hues, characteristic to sugar maple trees. The change in the leaves is not due to temperature as much as decreased light in the shorter days – many websites and apps are available to track the peak colours around the region. Updated: 7th March 2018. (First published: 8th January 2018).